Collapsible Frame - Marine grade, anodized frame with inflatable 10" wheels for a smooth ride. Supgrip Handle - Easy grab handle with heavy duty suction cups for a comfortable grip. 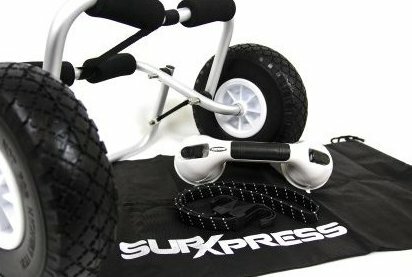 36" Bungee easily secures the SUPXpress to your board. Storage Bag stores your SUPXpress safely and securely.